These hand rolls are refreshing, healthy and packed with protein. Serve them with Pickled Ginger (page 173) and a side of Asian Kale Slaw (page 120). 1. In a food processor fitted with the metal blade, process soaked sunflower seeds, lemon juice, water and salt until smooth. 2. 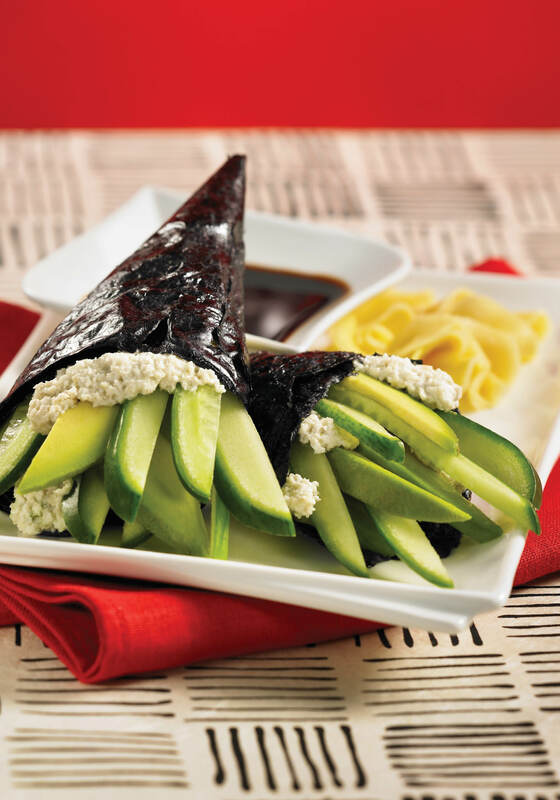 Place 1 piece of nori, shiny side down, in the palm of your left hand (if you are right-handed), long edge facing you. Place half the sunflower mixture on a diagonal starting from the upper left corner. Top with half the cucumber and avocado slices. Fold bottom left corner of nori over filling and roll into a cone shape. Repeat with second piece of nori. Enjoy immediately. To soak the sunflower seeds, place in a bowl and add 2 cups (500 mL) warm water. Cover and set aside for 10 minutes. Drain, discarding soaking water and any bits of shell or unwanted particles. Rinse under cold running water until the water runs clear. Be sure to use high-quality nori that is labeled “raw.” Purchase your nori from a reputable source such as your favorite raw foods retailer, health food store or well-stocked grocery store.